Fr. Rudy Romano, Jonas Burgos, Wiji Thukul, Somchai Neelaphaijit, Gao Zhishing, Mirhaj ud-Din Peerzada, Maina Sunuwar, Masood Janjua. Father Thiruchchelvan Nihal Jim Brown…… They are a few among the countless desaparecidos from all over the world, whom we especially honor this week, on the occasion the International Week of the Disappeared. Plucked from the bosom of their families, deprived of life and liberty and of the contribution they could have continued to share with their families and the greater society, they are stripped of all human rights. Their disappearance remains unresolved and their number continues to rise with each passing day. Each desaparecido is not just a part of cold statistics, but is a human being whose family, relatives, friends, community and society are made to suffer for the uncertainty of his or her fate. We remember the desaparecidos. They are the reason for the existence of our Federation, the very inspiration that moves us to tread uncertain paths to truth, justice, redress and the reconstruction of their historical memory. Many of them had earned the ire of the Machiavellian forces of our times. Their perpetrators made them disappear because in one way or another, they were involved or suspected to have been involved with the struggle for social transformation. On this week, we take a bit of time to pause… to ponder… to reflect on the very people who are, in spirit, giving life to our Federation. In times of adversities, manifested in the difficulty to face the perpetrators of enforced disappearances and their masters, we find strength and inspiration in them whom we firmly believe are continuously guiding us in our work. We hold hands with our sisters and brothers in Latin America, Africa, Europe and in the rest of the world in our unified struggle to realize our much-cherished dream for a world without desaparecidos. The 2008 report of the United Nations Working Group on Enforced or Involuntary Disappearances has recorded 21 Asian countries that submitted outstanding cases of enforced disappearances during the past year. This grim reality is all the more aggravated by the absence of regional human rights mechanisms in the Asian region, which is the only remaining continent of the world bereft of instruments for protection. In view of this, it is imperative that the United Nations Convention for the Protection of All Persons from Enforced Disappearance, which was adopted by the United Nations General Assembly on 20 December 2009, be entered into force at the soonest time possible. It has garnered 81 signatures and 10 ratifications. We need ten more ratifications for it to enter into force. However, amidst the dark night of the disappeared in Asia, since the historic signing of the Convention in Paris, France on 7 February 2007, no additional Asian country has signed, so far. In the Asian region, only four governments have signed and none has ratified. It is indeed, alarming that while the phenomenon continues to be unresolved in many Asian countries and unabated in a number of other countries in the region, Asian governments are not supporting this very important international treaty. On this 2009 commemoration of the International Week of the Disappeared, we renew our vow to continue their cause by vigorously campaigning for the immediate entry into force of the Convention. Much remains to be done in this uphill struggle to have the right to truth and the right not to be subjected to enforced disappearances be fully respected universally through the entry into force of the Convention, the ratification of as many governments as possible and the enactment of domestic laws criminalizing enforced disappearances. By our continuing struggle, the desaparecidos shall forever remain present in our minds and in our hearts. Their memory is like a shadow that will never leave us. IKOHI menyatakan keprihatinan dan kekhawatiran yang teramat dalam atas perkembangan politik menjelang Pilpres 2009 di tanah air, yang diyakini akan berdampak buruk bagi penegakan HAM, keadilan dan perdamaian di tanah air. Keprihatinan ini dipicu dengan pencalonan beberapa orang yang secara nyata diduga keterlibatannya dalam pelanggaran berat HAM dalam bentuk kejahatan terhadap kemanusiaan di Indonesia dan di Timor Timur sebagai Cawapres. 1. Minimnya suara dalam Pemilu Legislatif yang diperoleh Gerindra dan Hanura, menunjukkan aspirasi masyarakat yang tidak rela memberikan mandatnya kepada dua partai yang dipimpin oleh orang-orang yang bermasalah secara hukumdi bidang Hak Asasi Manusia. 2. Melihat Partai Golkar dan PDIP telah mengkhianati konstituennya, dan secara nyata telah menciderai kemanusiaan dan Hak Asasi Manusia karena atas nama nafsu untuk berkuasa mereka tetap mencalonkan tokoh-tokoh yang selama ini diindikasikan terlibat dalam pelanggaran berat HAM dalam bentuk kejahatan terhadap kemanusiaan, seperti pada kasus Timor Timur, Tragedi Mei 98, TSS dan Penghilangan Paksa 1997-1998. 3. Untuk tujuan membangun Indonesia yang sejahtera, adil, damai serta menghargai hak asasi manusia, IKOHI menyerukan kepada masyarakat untuk tidak memberikan suaranya kepada calon presiden/wakil presiden yang belum mempertanggungjawabkan keterlibatannya secara hukum dalam pelanggaran berat HAM di Indonesia. 4. Supaya Indonesia menjadi bangsa yang besar, berdiri sejajar dengan bangsa-bangsa beradap lainnya, menyerukan agar masyarakat tidak membiarkan Indonesia jatuh ke tangan capres/cawapres yang oleh masyarakat Internasional dianggap sebagai penjahat kemanusiaan dan bahkan tersangka, yang karenanya diancam oleh jurisdiksi internasional sehingga yang bersangkutan tidak berani ke luar negeri sebagaiman terjadi pada Cawapres Wiranto. 5. Dalam rangka peringatan 11 tahun reformasi, IKOHI menyerukan kepada pemerintah SBY-JK yang masih efektif hingga saat ini untuk segera mengambil langkah-langkah hukum yang tegas dan konkrit dalam penegakan HAM dan keadilan, dengan menyerukan jajarannya memproses lanjutan kasus Munir, kasus Mei 98, TSS, Lampung, Penghilangan Paksa 1997-1998 dan kasus-kasus lainnya. 6. Khusus dalam Kasus Penghilangan Paksa 1997-1998, IKOHI sangat menyesalkan sikap PDI-P yang memutuskan berkoalisi dengan Gerindra dan menjadikan Prabowo sebagai Capresnya Megawati. Hal ini menunjukkan PDI-P pimpinan Megawati sebagai partai yang tidak punya prinsip, mengkhianati ajaran Bung Karno, karena mereka memimpin Pansus Orang Hilang di DPR yang melibatkan Prabowo. Di sini PDI-P kelihatan sangat pragmatis, ahistoris dan mengabaikan suara konstituennya, karena sikapnya yang berubah 180 derajat dalam beberapa hari, hanya demi kekuasaan semata. 7. Berbekal pengetahuannya sebagai bekas anggota Dewan Kehormatan Perwira (DKP) yang memeriksa Prabowo Subianto, Muchdi PR dan Chairawan, dan sebagai Presiden saat ini, Susilo Bambang Yudhoyono harus menjelaskan kepada publik tentang nasib dan keberadaan 13 korban penghilangan paksa, sebagaimana direkomendasikan oleh Komnas HAM sejak tahun 2006. FOR the past 31 years, Viviana Diaz, a small, gentle woman now in her 50s, has devoted her life to finding out what happened to her father, Victor Diaz Lopez, a former leader of Chile's Communist Party. Following the bloody coup against Salvador Allende's left-wing government in 1973, he became one of the military regime's most wanted men. After nearly three years in hiding, he was finally picked up by the DINA, the secret police of Chile's dictator, General Augusto Pinochet. His family never saw him again. He was one of the many thousands who perished under the dictatorships that ruled many parts of Latin America in the final phase of the cold war in the 1970s and 1980s. A quarter of a century after the last successful military coup in Latin America, the region has moved on, with democracy for the most part firmly established. But in many countries, the past still poses some retribution or reconciliation? Find the truth, however painful, or prefer the ease of forgetting? Many argue for moving on rather than re-opening old wounds. Others reply that without justice there can be no healing and no guarantee of the rule of law. No group feels this more keenly than the relatives of the "disappeared"--those kidnapped by the state and taken to secret detention centres. Their tortured bodies, dumped in the sea or buried in unmarked graves, were rarely if ever found until well after the dictators departed. Unidentified remains are still turning up. In most countries in the region where abuses occurred under authoritarian rule--Guatemala (where 200,000 died in a civil war between military dictatorships and left-wing guerrillas), Brazil, Mexico and Uruguay—the process of dealing with the crimes of the past has barely begun. To a lesser extent, that applies to El Salvador too (see article). The process has gone furthest in Argentina and, especially, Chile. That marks a change. In Chile, some 3,000 people were killed or "disappeared" at the hands of Pinochet's regime. But the dictatorship's amnesty for its own crimes outlived it. Only recently have most families learned the fate of their loved ones. Take Mr Diaz's case. His family learnt of his arrest through an anonymous phone call. Then silence. After four months of searching, Ms Diaz and her mother, a washerwoman, met a woman recently released from Villa Grimaldi, a secret detention centre. She had a message for them from Marta Ugarte, another of the many communist leaders interned there. Ugarte's wrists had broken after she was strung up from the ceiling and her breasts were burned with a blow-lamp. She wanted them to know that neither she nor Mr Diaz would ever get out alive. For years, Ms Diaz staged demonstrations, petitioned the pusillanimous courts and badgered officials. But she was met only with death threats, repeated arrest and continuing silence. When democracy returned to Chile in 1990, the government set up an independent inquiry into the "disappeared". Even then, the perpetrators could not be brought to justice. It was not until Pinochet's arrest in London in 1998 in response to an extradition request from Spain, and the British House of Lords' rulings that he lacked immunity under international law, that Chile's judges began to grow much bolder. In a series of landmark rulings, Chile's Supreme Court removed most of the obstacles to trying the dictatorship's crimes. In 1999 it declared "disappearances" to be a continuing crime until death is proved. That meant they were not covered by the 1978 amnesty. In December 2006 it ruled that because Chile was in a situation of internal conflict after the 1973 coup, the Geneva Conventions applied. Serious violations of those conventions were war crimes and crimes against humanity, for which a statute of limitations could never be invoked, it said. Nor could they be subject to amnesty, it ruled last month. According to Chile's Interior Ministry, 148 people, including nearly 50 military officers, have already been convicted for human-rights violations during the 17-year dictatorship. Over 400 more, nearly all from the armed forces, have been indicted or are under investigation. Pinochet was himself facing trial on several charges, including murder, torture and tax evasion, when he died in December at the age of 91. It was as a result of one of these investigations that Ms Diaz finally learnt of her father's fate. Last month a man known (because of his size) as "the Elephant", who led the Lautaro brigade, a previously unknown elite unit of the DINA, tearfully confessed to murdering Victor Diaz at a barracks in Santiago in 1977 by asphyxiating him with a plastic bag, while cyanide was injected into his veins. His body, weighed down by a railway sleeper, was then thrown into the sea from a military helicopter. The truth, however painful, has brought her peace, says Ms Diaz. "disappeared" or were killed during the military dictatorship of 1976-83. Unlike Chile's, Argentina's military regime collapsed in confusion, following defeat in the Falklands war. The first act of the democratic government of Raul Alfonsin in 1983 was to annul the amnesty rushed through by the junta just before it fell. A truth commission--the world's first--provided the material for investigations by prosecutors, one of whom was Luis Moreno Ocampo, now chief prosecutor of the International Criminal Court in The Hague. Nearly 500 people, including nine members of the four successive juntas, were charged. Argentina thus became the first country to put its own military rulers on trial. The army argued that it had been forced to act by large-scale guerrilla violence. As in Chile, Argentina's military government had at first enjoyed considerable civilian support. Repeated barracks rebellions in protest against the prosecutions forced Mr Alfonsin to buckle. He approved a "full-stop" law halting new investigations, followed by another of "due obedience" which exonerated those who claimed to have been following orders--a defence dismissed in the Nuremberg trials after the second world war. His successor, Carlos Menem, issued pardons to 277 of those already convicted or indicted, including nearly 40 generals and several guerrilla leaders. Argentines still argue about these pragmatic decisions. Public opinion was certainly against them, and the thirst for justice was huge. One crime was not covered by the various amnesties and pardons--that of taking away the babies of mothers who gave birth in captivity, and giving them to couples in the security forces to bring up as their own. 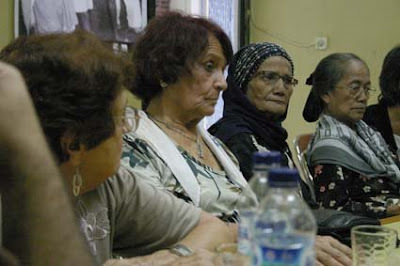 "Grandmothers of the Plaza de Mayo", who from 1977 demonstrated on the square of that name in Buenos Aires, some 500 babies were stolen in this way, only 87 of whom have so far been traced. Pinochet's London arrest emboldened judges in Argentina too. Soon afterwards, General Jorge Videla, the junta president of 1976-81, was put on trial on charges of appropriating babies. 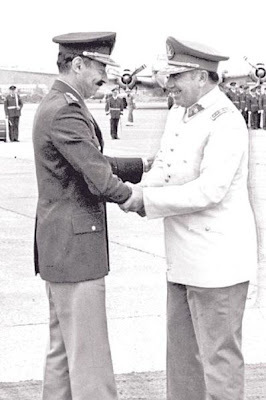 For this, General Videla was sentenced to eight years imprisonment. He had already received a life sentence in 1985. His subsequent pardon was quashed by a judge last September on the ground that he was guilty of crimes against humanity and could never be pardoned. Because he is aged over 70, General Videla is now under house arrest. In 2005 Argentina's Supreme Court annulled the "full-stop" and "due obedience" laws as being unconstitutional. That has paved the way for the prosecution of other junta crimes. Of the 772 people, nearly all in the military or secret police, now facing charges or investigations, 260 are in pre-trial detention (including 71 under house arrest), 46 are on bail, 41 are on the run, and 109 are dead, according to the Centre for Legal and Social Studies, a human-rights group. Five people have so far been convicted, including two on "disappearance" charges. The government expects another half-dozen trials to take place this year. Years of further trials lie ahead. These prosecutions are backed both by the current Peronist president, Nestor Kirchner, whose government includes several former followers of the Montonero guerrillas, and by public opinion. Unlike armies in many other Latin American countries, the army in Argentina is no longer much respected. In opinion polls 70% of respondents approved of the court's annulment of the amnesty laws. No new prosecutions are being brought against former guerrillas. The government argues, with questionable logic, that they were not guilty of crimes against humanity and are thus subject to the statute of limitations. But prosecuting Isabel Peron, the third wife of Juan Peron, the country's revered populist leader, is a step too far for many Argentines. On Peron's death in 1975, Isabel, a former cabaret dancer, succeeded him. Amid growing economic chaos and violence between the guerrillas and right-wing death-squads, she signed decrees in 1975 authorising the eradication of all "subversive elements". Some say that the Argentine Anti-communist Alliance (known as the "Triple A"), a government-backed death-squad, was responsible for at least 1,500 killings during her 20-month presidency. Since her release from prison by the Argentine junta in 1981, Mrs Peron has lived in Spain. She claims ignorance of abuses during her rule. But in January she was arrested in Madrid at the request of an Argentine judge investigating the "disappearance" of a Peronist militant in February 1976. Four days later, a second warrant for her arrest was issued by another judge on charges relating to the "Triple A" killings. Aged 75 and said by her lawyers to be suffering from manic depression, Mrs Peron has been released on bail while awaiting the outcome of extradition proceedings. Few expect them to succeed. As the experiences of Chile and Argentina show, each country has to find its own way of dealing with past atrocities in accordance with its own particular circumstances and history. Sometimes, it may take a whole generation for society to be ready to learn the truth, as in Germany after the second world war. At other times, an amnesty, which may later be unpicked or annulled, may help to secure peace. The rise of international human-rights law has helped those who argue that in cases involving the worst crimes justice must never be sacrificed to peace. Where conflict continues that principle may be hard to apply. Its proponents say justice is essential not just as an end in itself but to deter future tyrants. Until recently, most could expect to get off scot-free. Increasingly, other countries may follow the road pioneered by Chile and Argentina.